These best-of-the-best rice recipes include everything from delicious fried rice recipes to savory coconut rice, sticky rice, even rice salad. Colourful and fragrant, my rice recipes are sure to please your taste-buds and your senses. Serve as a side dish or the main event - either way, they'll make any meal especially delicious. 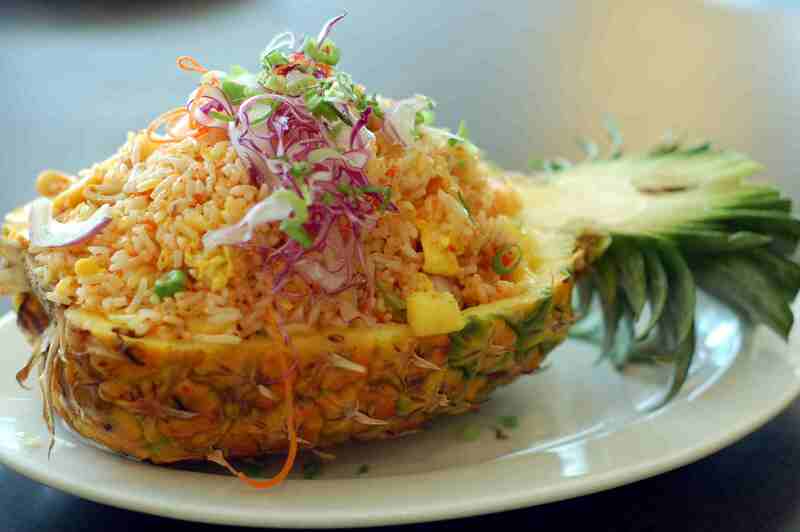 Heavenly Fried Rice is the signature dish of Thailand, normally served in a carved-out pineapple. But even served straight out of the wok, I find this to be the tastiest rice dish I've ever tried - it's my absolute favorite. And it isn't difficult to make - this easy Thai recipe will have you cooking and enjoying this heavenly treat in no time. Learn how to make perfect steamed white rice without actually having to steam it! An easy step-by-step recipe that will free you forever from slavery to your rice cooker! In this fried rice recipe, fresh or frozen shrimp are quickly stir-fried with garlic and onions. Add the cooked rice, a couple of eggs, frozen peas, plus my own special Thai sauce, and you have a fried rice recipe that is sure to please everyone. A great way to use leftover rice - and leftover roasted chicken can also be added if you have some taking up space in the refrigerator. Add chili if you like it spicy. Delicious! Coconut rice makes an impressive accompaniment to many Thai dishes such as curries and fish favorites. Although you can make coconut rice in a rice cooker, this recipe teaches you how to make it the old-fashioned way - in a pot on the stove. Quick and easy, this coconut rice recipe will come in handy for those times when you want to make dinner extra special without going to a lot of extra work. This simple, yet wonderful recipe for Chicken Fried Rice will please everyone at your table. It's easy to make and just as tasty as the fried rice you'll get at your favorite Asian restaurant. If you happen to have 'old' rice (leftover from other meals), fried rice is the perfect way to use it up; but even freshly-made rice makes for great fried rice when fried up in the right way and with the right sauces. This recipe will teach you how to do just that, so your fried rice tastes as light and flavorful as it possibly can. Give it a try! This Yellow Rice Recipe turns out beautifully golden and very fragrant. While yellow rice is often made with saffron, it can easily be made with turmeric instead, a spice which also has incredible health benefits (in Thailand, turmeric is known as 'poor man's saffron'). Makes a beautiful side dish to any meal - wonderful to serve guests! This easy recipe for saffron rice hails from the south of Thailand, where it is often eaten with roast chicken. Saffron rice makes dinner extra special and is nearly as easy to make as regular rice. You needn't own a rice cooker to make this recipe either - it's boiled in a pot on the stove, but tastes every bit like steamed rice! And unlike most saffron rice recipes, this one is fat-free. Because saffron is so expensive, I only use a little bit, then enhance the color by adding turmeric - a spice which also has incredible health benefits. Enjoy! This Thai take on Chicken Fried Rice is SO good and so easy. Very aromatic, this fried rice recipe features fresh basil and lime leaf for an exquisite Thai taste that is a big step above ordinary. This sticky rice recipe is simple to make and oh so delicious! A meal unto itself, this Thai Sticky Rice with Pork & Mushrooms is a savory dish that is similar to fried rice, except it has a wonderfully chewy texture that even kids enjoy. If you like coconut rice, try this delicious Thai coconut saffron rice recipe. Instead of choosing between saffron rice and coconut rice, I've combined the two into one recipe. The result is a beautifully golden rice that tastes wonderful and is great to serve company or take to a dinner party or potluck. Mushrooms and rice go together beautifully in this Thai recipe for fried rice. Includes other veggies too, like peas and yellow pepper, for a rice dish that sings with flavor, texture, and supreme freshness. This Thai Yellow Fried Rice is colorful, easy to make, and tastes amazing. Made with fresh or frozen shrimp, this fried rice recipe also features greens, such as spring onion, fresh coriander, and peas. Turmeric is the special ingredient that makes the fried rice yellow, and because of its incredible health benefits, the addition of this spice makes this recipe a good-for-you treat. A great way to use up leftover rice - rice that is several days old is perfect for this simple but extremely tasty recipe. Enjoy! If you're looking for a delicious way to cook brown rice, try this wonderful Thai Brown Coconut Rice! Coconut rice is a favorite side dish that works well with a number of different mains, including Thai and Indian as well as Western dishes. Easy to make, too! Thai sticky rice is also known as "sweet" or "glutinous rice". Sticky rice makes a delicious accompaniment to various main course dishes, especially anything with a sauce. Similar to Japanese rice, Thai sticky rice is excellent served with saucy stir-fries or curries. While it can be made in a rice cooker, here I'm going to show you how to cook sticky rice in a pot on your stove. ENJOY! Sticky rice is normally steamed, and because of this, few people here in the West can be bothered making it. But did you know you can also make sticky rice in your rice cooker with delicious results? Using a rice cooker cuts down on all the steps involved, and is so quick and easy to do, you'll find yourself enjoying sticky rice more often. This saffron rice may just be the easiest rice recipe you'll ever make. Just put together a few ingredients and let them simmer in your rice cooker while you get on with other things. Saffron rice makes a delicious accompaniment to all types of Southeast-Asian and East Indian dishes but is equally beautiful to serve alongside nearly any Western dish you might be making. This Thai chicken and rice recipe, called "Rice of the Sultans", is flavored with spices not usually thought of as Thai. Many centuries ago, traders from Indonesia brought exotic spices to Thailand such as saffron, cinnamon, and nutmeg. In Thailand, such culinary riches were still new and terribly expensive. Thais gave this special chicken and rice recipe its name for the rulers of Sumatra, who were sultans and could afford such luxuries. Thai Sticky Rice Dessert with Mango (Khao Niaow Ma Muang)is an absolute must try! This recipe is foolproof and even budding chefs with two left hands come off smelling mango sweet. This easy Thai dessert starts with Thai sweet rice (also called sticky rice) which is surrounded by a "bath" of coconut milk, then topped with slices of fresh (or frozen) mango. If you like mangos, you're going to love this very simple but tropical dessert. Coconut Rice makes a deliciously easy side dish that can be served with a variety of dishes such as curries, stir-fried vegetables, plus fish and seafood mains. This easy coconut rice recipe is made in a rice cooker (for coconut rice made in a pot on your stove, see link within this recipe). All you need is some rice, coconut milk, water and salt! This coconut rice recipe also pairs beautifully with Indian food dishes. For perfect-tasting rice every time, just follow the steps of this easy coconut rice recipe! It will show you everything you need to know about cooking rice the simple way - in a pot on your stove. Easy and so very delicious, this coconut rice makes a terrific side dish to nearly any meal. Enjoy!